The Jitter-Ring is also known as the Gyro-Ring, and Chatter Ring. You begin by holding the metal ring and strike the smaller, colored discs. As you rotate the ring, the discs begin spinning faster and faster, like mini-gyroscopes! 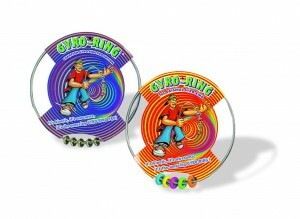 At first, the challenge is to keep all the discs spinning, then there are lots of tricks and stunts to master! It’s Kinetic, It’s Awesome, Strike it up! The discs spin up to 1000 rpm! Hours of fast-paced excitement for all ages! The Jitter ring is really just 5 little tops of slightly unusual design which are strung onto a metal ring so that they can freely spin. Have you ever noticed that when you spin a coin on a surface, it appears to spin much faster just before it comes to a halt? It’s the same with these little tops! You have to keep each of these little tops in perpetual wobbliness! This rotation of the spin axis is called precession and causes the ring to press on one side of the hole in the spinning top. The contact point between the ring and the top can be thought of as a gear that changes the motion of the upward moving ring into the top’s spinning motion. Hold the large metal ring with one hand. Use your other hand to spin-up washers. One method that works particularly well is if you rest the beads on your index finger halfway up the ring, and then flick the beads to the side with your thumb. Once the beads have began vibrating, you need to rotate the ring towards yourself. What you are doing here is actually pulling the large ring through the small beads! The friction from this action is what keeps the beads vibrating/spinning fast. Try to hit all the beads evenly when starting the ring up. Remember that the aim is to vibrate the beads, not to wallop them with as much force as you can manage! Use a light but firm touch. Try to move the ring smoothly, without wobbling it from side to side. You will notice that the faster you move the ring, the higher the beads rise towards your hands. Practice, Practice, Practice! You need to master this trick before you can move on to doing all of the tricks described below! Throw and Catch It should be possible for you to throw and catch the Jitter Ring once the beads have started wobbling. It takes a bit of practice for the beads not to have stopped, and for you to make a firm solid catch (and not catch the ring at the part where the beads are!) As soon as you catch, begin feeding the large ring through the beads once again to keep the speed up. How high can you throw and catch while successfully keep the beads spinning? Backward Turn Grasp the ring with one hand and begin turning it. You need to keep the large ring moving through the beads during all of this time or else the beads will come to a halt. Once the ring has completely turned, you will need to remember that the ring will now be needing to go in the opposite direction through the beads! It’s not as easy as you might think! You have a choice of turning the ring the full 360 degrees, or reaching the point where you are feeding the ring backwards, then returning the ring back the way you turned it. Turning clockwise is easiest with the left hand and vice versa for right hand. You can try all the following tricks using one hand or two hands!